When Amazon announced Amazon Underground, a new app marketplace where many freemium games are made "actually free," everything seemed pretty great. You can make in-app purchases on apps downloaded from Underground without actually spending money, which is my favorite way to buy things. Of course, if you spend much time thinking about how this must work behind the scenes, it's tough to see how this will be a winner. Okay, that might not be quite how it works. But the gist of it is that developers will be paid 1 penny for every 5 minutes an Underground customer is using their app. There are a couple of assumptions at play for developers to be on board. First, you must believe you are attracting users that would not have been willing to pay much/anything for those IAPs. Second is that Underground will attract a lot of them, enough to make up for the fact that you only earn 12 cents per hour per user. For some, this could work out really well on the development side of things. It's not out of the question for certain types of games to have individual users reach 100 hours of gameplay, which would make you $12 on one person. Amazon's example is getting users for 4 hours per month, netting a developer roughly $0.50 per user each month until they quit using the app. There will probably be some big winners here since they won't ever stop making money from the people using their app. Still, users who play a freemium game that much are also those most likely to splurge on big IAPs. The question some developers have to answer is whether Underground will attract the huge spenders that their app may depend on, cutting off major sources of income, or if it will instead only bring on users who would never pay. 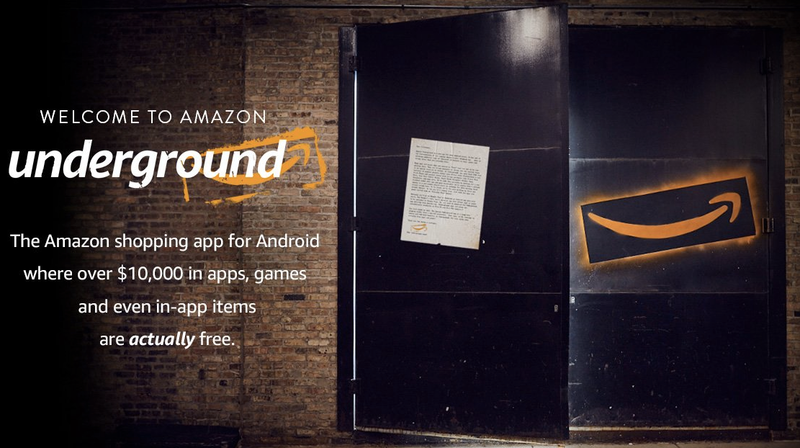 The Amazon Underground app is a long-term program rather than a one-off promotion. Over time, we'll continue to invent and add more benefits to Underground. For now, enjoy some actually free apps and games! In other words, Amazon will tell you what part of Underground makes them money when they find out. Ars Technica pointed out that the Underground app is stuffed to the gills with ads, but that's not going to recoup the money in all likelihood. There are still paid apps available due to not everyone opting into the Underground program, so the hope may be for more conventional app purchases. It isn't insane for Amazon to approach this with the idea to just get everyone to download an Amazon app market on their Android device and figure out the money-making part later. It's one of the benefits of being a huge company, you can take expensive bets. Time will tell how it works out.